You're Doing a Whole WHAT? I'm sorry, I thought you just said that Rachel was going to do a Whole 30 challenge. Most bloggers end their year with an interesting recap documenting the year's most popular posts. While that's an entertaining enough thing, you've read all those posts so rounding them up again isn't going to do much toward growing this little community. I mean, we could talk about how my post about hostessing failures has more page-views than almost any other post this year (even some of the old ones) and yet not a single comment. Or how a post about becoming a better coffee shop customer has hundreds more page-views than even that. Latte drinkers be advised: your manners are being considered. No, rather than round up these posts, I'm looking ahead. More specifically I am looking ahead to January when I've agreed to do the Whole30 challenge with a couple of friends. I know, right? Keep laughing - I am too. Miss Gingerbread & Cake, Queen of the Kingdom of Brie, is giving up dairy, grains, sugar, legumes, corn, soy, and a host of other convenient foods for an entire thirty days. Believe me, it took several days of severe convincing before I agreed. Unlike a lot of people, I don't want to make any resolutions come late December. I didn't want people to think I was making any resolutions. Everybody starts January with the best laid plans to lose weight, whip their eating into shape, and then generally fail. So joining the Whole30 challenge isn't about weight loss or eating reform for me. Instead, it's half a way to jump start my year by taking extra interesting care of myself in the first thirty days and half a way to challenge my cooking in a way I've only challenged myself once before. I can't shop for all of my groceries at Whole Foods. I can't afford giant piles of specialty replacements for common groceries. This means that I am going to have to find variety without completely cleaning out my finances. Meat and nut proteins will be the largest expense but I hope to compensate for that by finding deals on produce at places like Aldi. I refuse. I absolutely refuse to go hungry in the name of health. I firmly believe that you can eat in an extremely healthful way and still be full after every meal. But my schedule is busy and I am often gone from 8:30 in the morning until 9:30 or 10 at night and working that off a Whole 30 meal plan is going to be interesting. Yet I'll do it. Someway, somehow, even if that means bringing half the fridge with me. Okay, so I know this one will be hard to achieve when most of what I'm eating are packed lunches that don't involve the trifecta of bread, cheese, and grains, but I am determined to stave the wolf, Boredom, off with a load of research, other peoples' recipes, and a little native ingenuity. I am already tired of the idea and it isn't January so this isn't necessarily a good sign. Don't worry. I'll be fine. And of course, the last one. Because if I stop before my thirty days are over, I will have proven the point I hope to disprove: that I, Rachel Heffington, can't manage to liven up a dull eating challenge or, you know, complete it at all. So yeah. That'll be me at the end of 2017. Determined. Somber. Wary. Spending New Year's Eve casting some serious side-eye at my choices, eating cheese, and thinking about the long farewell. You can do this! I, for one, have always been interested in the Whole30 challenge but never nearly so interested as to actually do it! I'm very interested to see what recipes and other ingenuities you come up with, and you just might convince me to try it myself soon! :) If I can handle losing bread and cheese. Eep. you got this girl! I myself have embarked on the whole thirty and crashed. lol. Haha! I love the honesty, Jana! I am sure I will unwittingly break it in a few places (like the breathmint habit? I will probably accidentally consume at least one). Also - who knew organic chicken broths had sugar in them? I love the reason behind it!! I would especially love to follow what you do for breakfasts! I'm looking forward to changing that up cuz a lot of mine are so bready! You can do it lady! And so far you seem to be crushing it. 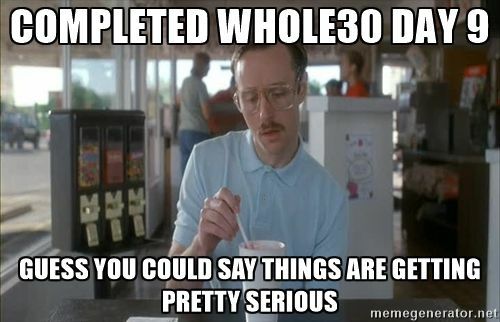 ;) I actually ate much more interesting food on Whole30 than I had before because it required me to be more intentional. I eat much more boring meals most of the time now hahaha. Gotta get back on track! Can't wait to hear your thoughts along the way and at the end.